Stafford Brothers Feat. Eva Simons & T.I. 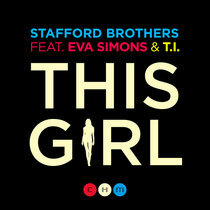 Stafford Brothers recently released their new single, ‘This Girl’ featuring Eva Simons & T.I., along with four remixes, on CHM Records. Following up on their triple platinum selling single, ‘Hello’ featuring Lil Wayne and Christina Milian, the three-times voted #1 DJs in Australia deliver another track that has already been taking over the airwaves down under. In collaboration with Eva Simons and T.I., the Stafford Brothers have crafted a vocal house jam that may be just as fitting for rocking dance floors as it is for radio. In addition to the original, the Staffords have rounded out the release with four remixes of the single from up-and-coming artists - Togglehead, Parker Ighile, SCNDL, and Tom Swoon. Toronto-based Togglehead brings his own rave-ready vibe on his banging electro-house remix, while Parker Ighile goes for a groove-driven sound with his deep house rendition. Australia's own SCNDL stays true to their hometown dance music style, transforming the track into a "Melbourne bounce" smash. Finally, Tom Swoon takes the single into the progressive house realm with a festival main stage vibe.